This week I am facing one of the good, right and hard aspects of travel: an unfamiliar culture is making me face my bias, my sub-conscious programming. I am struggling to find a new frame of mind in which to manage these unexpected truths. My bias has been programmed into me by American history. Do you have the same bias? How do these pictures make you feel? 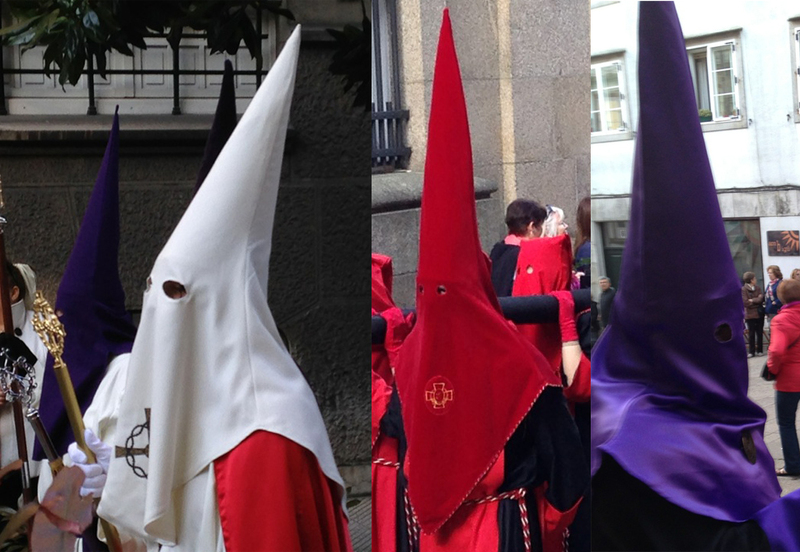 Capirote during Semana Santa: white in Oviedo; red and purple in Santiago de Compostela. In Spain these conical masks, capirotes, have been part of Semana Santa celebrations for more than 500 years. At various times during the week between Palm Sunday and Easter, people all over Spain don capirote of various colors—each color combination belongs to a specific society associated with a specific church—and take part in precessions. What’s the point of a precession? If you want more background, I point you to Alison’s lovely entry about one of her early precessions. What’s my problem? What’s my programming? Masks and cloaks very similar to the capirote were used by the Ku Klux Klan to continue the subjugation of African Americans when the civil war and reconstruction made such action, at least in principle, against the law. My bias? In bald language: people in pointed hats and masks, hiding their identities, are evil. Mean. Cruel. Wicked. Without compassion. Backward. My bias was in my lower brain stem. Emotionally I was condemning everyone in a capirote. Color of the cloth? Don’t care. Christian religious relics? Don’t care. Repenting your sins? Don’t care. My gut told me that I was watching a parade of mean, cruel, wicked, compassionless, backward people. Almost worse, I was surrounded by a crowd of their supporters. I wanted to tear their capirote off and call them out. How was I dealing with my bias? Uneasily is the fast answer. Unsuccessfully is another fast answer. Until today. Until Easter Sunday. What happens on Easter Sunday (at least in Oviedo) that has helped me find a new, more compassionate, less judgmental frame of mind? After Easter mass, the marchers of Oviedo—the people we’ve seen in precessions earlier in the week—march in their robes but with their capirote removed. 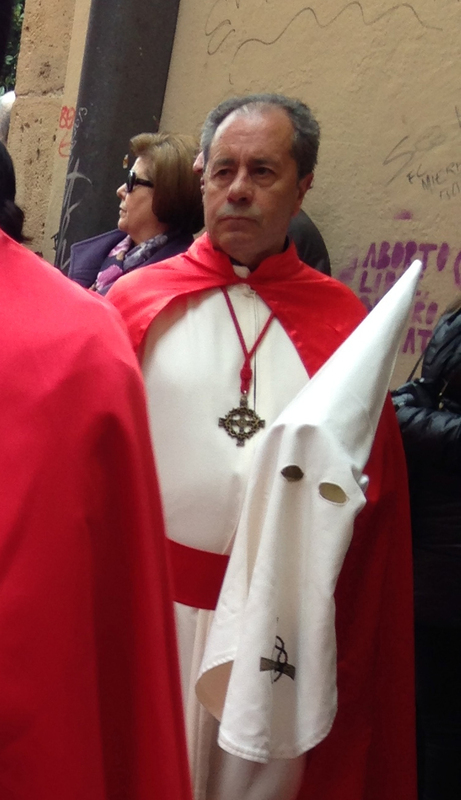 A marcher in Oviedo on Easter Sunday, capirote removed. The single moment that helped me transform? The moment I could recognize a specific marcher from a Friday night procession on Sunday morning’s procession. She had limped through the procession on Friday night with two elbow crutches and an attendant. Unique. Having one similar crutch, I could admire a marcher’s determination even though I was emotionally condemning. Seeing her on Sunday morning, hood draped over her shoulder, still with crutches and attendant, middle-aged face turned toward the Jesus-is-risen relic at the front of the procession, I had much more difficulty ascribing evil to her. In my opinion now, it is the second part of the Semana Santa procession (At least as practiced in Oviedo.) that gives it its greatest meaning, its greatest value to humanity. 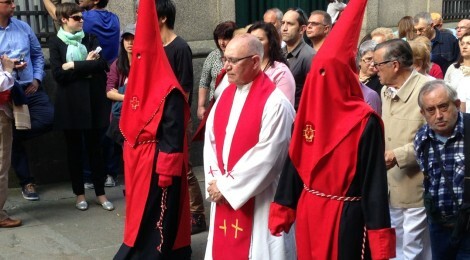 Here is some value: In the precessions before Easter, those who are atoning their sins wear the capirote to attain anonymity. “I’ll wear this mask, no one will know how bad I’ve been, and I’ll work off my debt to humanity by marching in the streets.” (Thanks in advance to everyone who is letting me boil a couple of thousand years of religious tradition into a not-very-religious sentence.) They atone without public ownership. Here is the greater value: In the precession after Easter, those who have atoned sins cast off their capirote. “If I am diligent, if I atone, I need not hide myself.” Forgiveness and honesty walk together. Human forgiveness. Human honesty. Truth and reconciliation. Did Nelson Mandela or Desmond Tutu visit Oviedo? And me? In my biases, you must count me among those who have sinned, among those who must atone. The wiki page on Klu Klux Klan regalia notes the similarities in costume but ascribes them to independent sources.